An ophthalmologist (Eye M.D. ), is a medical doctor who specializes in the refractive, medical and surgical care of the eyes and visual system and in the prevention of eye disease and injury. The ophthalmologist has completed four or more years of college premedical education, four or more years of medical school and four or more years of residency, including at least three years of residency in ophthalmology. 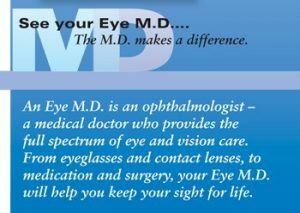 The ophthalmologist is a specialist who is qualified by lengthy medical education, training, and experience to diagnose, treat, and manage all eye and visual system problems and is licensed by a state regulatory board to practice medicine and surgery. 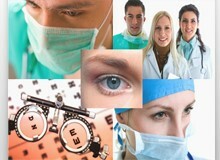 The ophthalmologist is the medically trained specialist who can deliver total eye care: primary, secondary, and tertiary care services (i.e., vision services, spectacle and contact lens prescriptions, eye examinations, medical eye care and surgical eye care), diagnose general diseases of the body and treat ocular manifestation of systemic diseases.